Watch the deadliest doctors in the Full Moon universe take lives instead of save them! 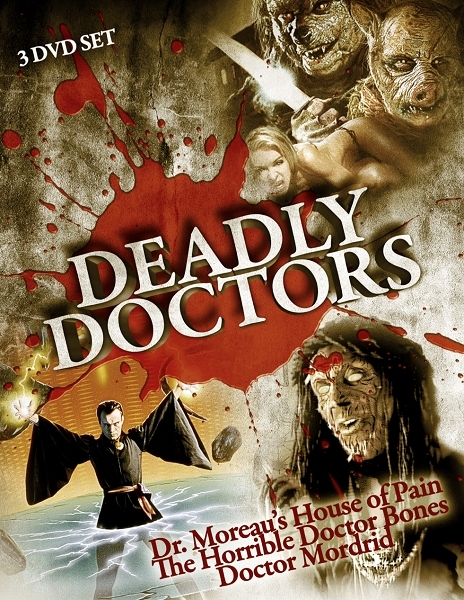 This new collection includes Dr. MOREAU'S HOUSE of PAIN, THE HORRIBLE DOCTOR BONES, and DOCTOR MORDRID. All three DVDs come together in a special, space-saving slimline DVD case. Some legends are reborn. And some never die...Eric Carson is searching for his brother, an athlete who came to the secret hospital of the legendary Dr. Moreau to help him with a rare blood disease. The boy was subjected to Moreau's radical transplant techniques, an operation that turned him into half man/half panther. The Doctor is in the house...A dynamic rap group called the URBAN PROTECTORS think they've finally gotten their big break when they are discovered by notorious record producer, DR. BONES. What they don't realize is that Dr. Bones has a diabolical plot to dominate the world with an army of zombies who use the Protectors' music as their own deadly anthem.